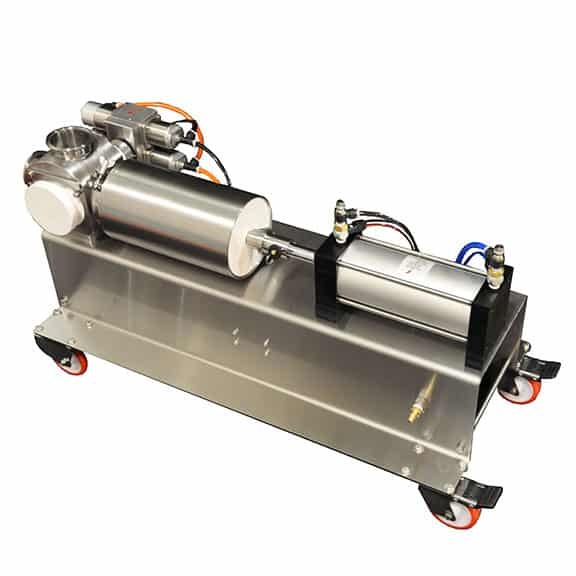 Volumetric Technologies Food Grade Transfer Pumps are designed to gently transfer your flowable products to your filling, depositing or processing line. They are also used for pumping products to and from cooking or holding tanks for further processing. This is all done with gentle piston pump action that reduces product degradation. Our Food Grade Pumps are low shear pumps which will not damage your products. These pumps are designed to handle thick or thin products, hot or cold products, and products with and without large particulates or solids. Our Food Grade Transfer Pumps are very reliable and are easy to clean. The tool free design means you can disassemble and reassemble in just minutes. Flow controls are standard on all transfer pumps, giving the operator control to adjust the output of the pump. A Volumetric Technologies Food Grade Transfer Pump is the perfect choice when transferring pie filling, soups, soup bases, pasta sauces, BBQ sauce, BBQ meat with sauce, Deli salads, macaroni and cheese, muffin batter, cake batter, guacamole, coleslaw, stew, refried beans, chili, cheese sauce and many others.